Luckily, Marissa is naturally frugal and doesn’t carry any credit card debt. Besides, she’s already noticed a significant decrease in the amount she spends per month since her and her husband, Teri, split two years ago. 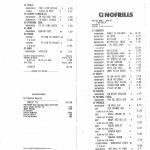 Teri was a diabetic and a bit of a foodie, so their grocery bill previously included a ton of meat and more gourmet items. Things have since changed. Click to view the full receipt. Instead, she now tends to prepare simple, low-prep meals that also happen to be wallet-friendly, like mac and cheese, tacos, and rice and chicken. Starches, one of the cheapest food items available, make up much of her meals when she’s solo. “I get so tired cooking for my family so when it’s just me, I eat popcorn,” she says. All this adds up to why her monthly grocery shop only totals around $575 for the three of them. At around 10 per cent of her take home income, that’s well within the levels experts recommend. 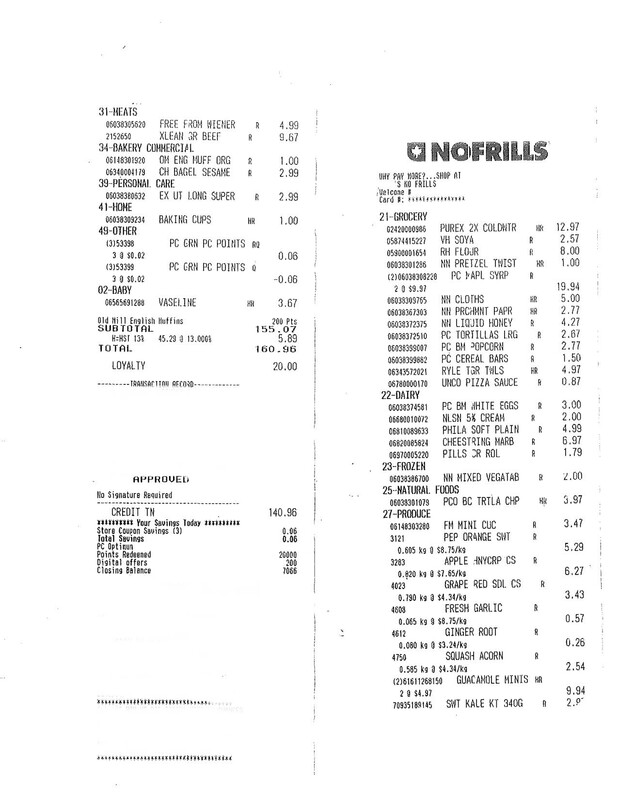 This time around, Marissa spent $160 at No Frills, getting $20 off with her PC Points, paying a total of $140. Still, by paying just a bit more attention she can easily shave at least a hundred dollars off that bill. Marissa is addicted to seeing points rack up on her PC Points program. The psychology behind loyalty cards is too deep to go into here, but it’s clear the reason so many businesses now have them is because they work— shoppers spend more money than they would otherwise. Look at Marissa, who purposefully shops at Loblaw and Shoppers Drug Mart in order to maximize points, even though those are some of the most expensive stores around for groceries. If she really wants to save money, she can easily save 30% off her bill simply by choosing a discount grocery chain. She happened to do that this week, at No Frills, but she admits that’s an anomaly because it’s out of her way on her drive home from work. It’d be best to make that a habit. No Frills, in fact, is the best of both worlds: she’ll get the points she craves and the lower prices she needs. 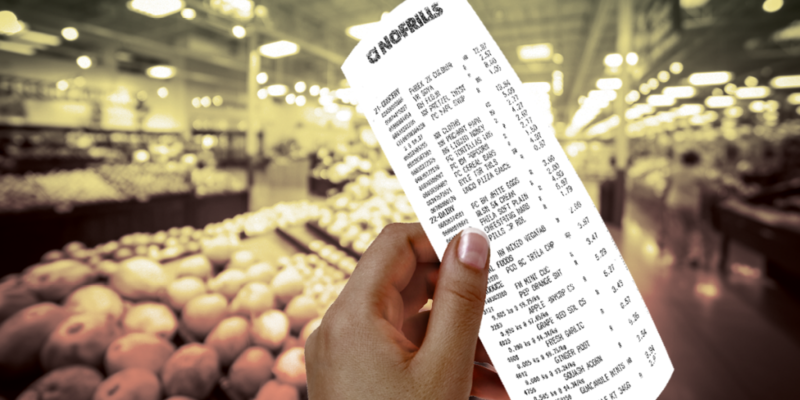 She may have saved $20 on this grocery bill through PC Optimum points, but shopping smarter and buying bargains would likely save her much more in the long run. Starches have the potential to be some of the cheapest food stuffs available, but not the type that Marissa bought. The cheapest starches are those that come from the ground, like rice. Then we have the minimally processed kind, like pasta. Then we have the kind that Marissa spent a total of $20 on, which have been researched in a lab, and assembled, sweetened and preserved with various corn derivatives. For the cereal bars, English muffins and tortillas she bought, she’s not only paying for the product, farmer, and transportation but also the effort that went into creating it, and figuring out how to sell it to you. All that marketing just so that Marissa would pick it up off the shelf and choose to feed it to her family costs money. Using some of the flour she bought, she can easily make these baked goods at home, and the end product will be far healthier, too. Marissa admits she doesn’t care much about unit price. “If I want a chicken breast, I want a chicken breast,” she says. But she’s convinced once she hears the actual price disparity that exists. A chicken breast is almost two and a half times more expensive by weight than a whole chicken, at $15/kg versus $6.15/kg, respectively. Although she purchases little meat, she does buy $25 of some of the most expensive produce available. 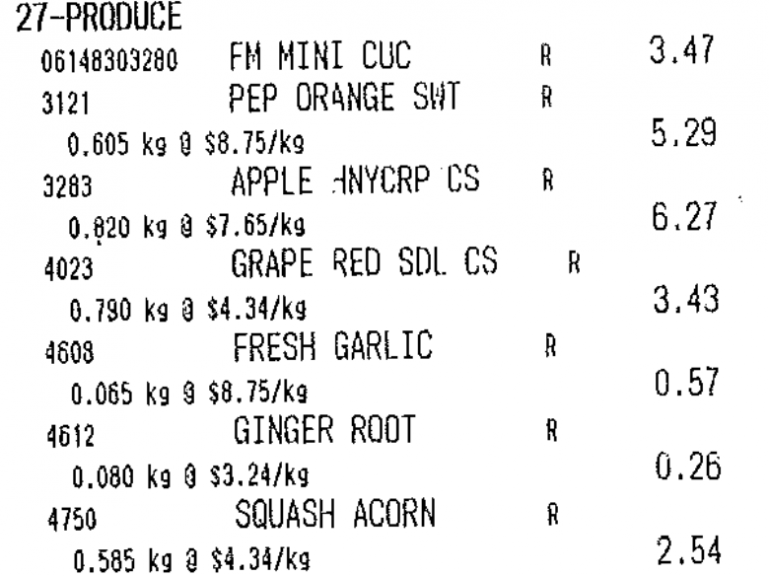 Spending over $8.75/kg for peppers and $7.65/kg for apples is just unnecessary when there are so many healthy and flavourful fruits and vegetables for a quarter of the price. To get more bang for her buck she should look at carrots, ($2.15/kg), cabbage ($1.5/kg) organic bananas ($1.92/kg), tangerines ($2.80/kg), long eggplants ($2.80/kg) and melons ($2.80/kg). Marissa has a habit of buying things in pairs. On this bill, for example, she spends almost $20 on maple syrup and $10 on guacamole (luxury items by any measure, that, if eliminated, would save 19% on the grand total). This is exactly what the marketing mastermind at Loblaw HQ want shoppers to think. When an item has a yellow sign in front of it that says “buy two for $4, or one for $2.29”, it seems like a no brainer. Why buy one, when you’ll probably need two anyway, and then also save a bit? But it’s just pushing you into potentially buying more than you need, and spending more than you would otherwise. If you truly need two of the item, and you need it today, okay fine. But these types of promotions almost never happen on produce or meat, but only on stuff that you can store for a long while. It’s far better to wait and watch the flyers until the item goes on an actual sale, and then stock up. Ultimately, Marissa prioritizes convenience above all else. But whittling down a bill doesn’t require a huge investment in time. Knowing which foods costs more and why is the first, essential step. Often just knowing that a product is three times more expensive simply because the butcher peeled the skin off is enough incentive to do it yourself. Additional ways she could save with barely any effort is by driving an extra five minutes to a discount-grocery chain for ingredients and spending Sunday afternoon baking with her girls, a hobby she already enjoys. By paying a bit more attention, and changing a few habits, we’re confident Marissa can hang on to more of her hard-earned funds. WATCH: Is the Roomba worth the hype?